At the Feldman Hip Center, we have extensive experience in treating a wide variety of complicated congenital and developmental hip deformities in children and adults. We offer a customized, comprehensive approach with a focus on hip preservation and reconstruction, delaying the need for hip replacement surgery as long as possible. 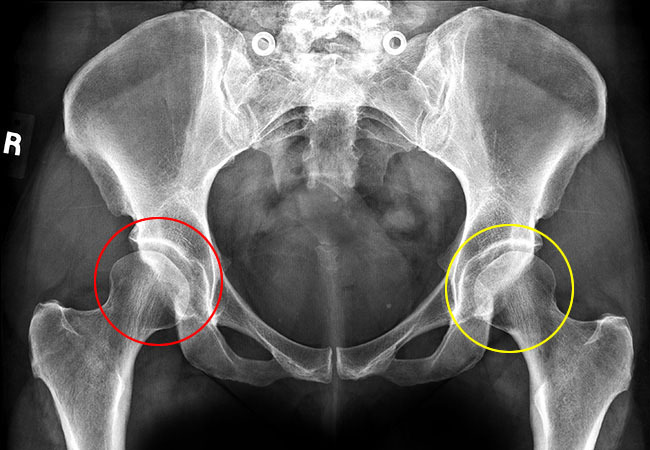 A condition where the hip's ball (femoral head) and socket (acetabulum) are misaligned. The condition is common in children but is also found in adolescents and adults who have had no history of hip problems in childhood. Treatment options include temporizing with medication and/or physical therapy, but surgery, including hip arthroscopy, periacetabular hip osteotomy, or femoral osteotomy is often required to fix the problem. Perthes Disease (formally Legg-Calve-Perthes disease) is an uncommon condition that affects one, or sometimes both, hips of a child between the ages of 3 and 15. For unknown reasons, the femoral head loses part (or all) of its blood supply and part (or all) of the bone of the femoral head dies. The first symptoms of the disease manifest a few months after the initial loss of blood episode. As bone in the femoral head dies, the hip joint gradually deforms, and the femoral head may become misshapened and flattened. There are many treatment options presented to patients with Perthes, including crutches, physical therapy, range of motion exercises, core decompression, contaiment, distraction, and femoral head reshaping. At the Feldman Hip Center, we have extensive experience in all common treatment methods for Perthes. Our experience greatly aids in determining the best treatment strategy for each individual patient. In all types of treatment for Perthes, the goal is the same: reduce pressure on the weakened femoral head so that it can heal and reform its proper, spherical shape. The older the age of onset (over 6 to 8 years old), the more extensive the treatment required. Avascular necrosis (or AVN) is a condition very similar to Perthes disease but often affecting older patients, particular in adolescent children where it is often referred to as Adolescent AVN. As in Perthes disease, lack of blood supply to the femoral head results in osteonecrosis (dead bone) and collapse and deformity of the femoral head. At the Paley Institute we treat Hip AVN with a core decompression (a method of drilling into the femoral head to restore blood supply) and/or a hip arthrodiastasis (a method of using an external fixator to distract the hip joint, allowing the femoral head to heal). Also known as Congenital Dislocation of the Hip , CDH, or DDH, it is a pediatric orthopedic condition in which a newborn or young child is found to have a dislocated hip. 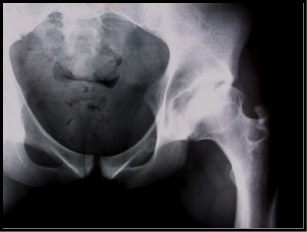 If left untreated, DDH can lead to the development of hip dysplasia and osteoarthritis later in life. Treatment may involve non-operative techniques, such as bracing, casting, or harnessing (Pavlik harness). Operative intervention usually involves reducing the hip into the acetabulum (hip socket), following by a pelvic or femoral osteotomy to improve hip coverage. A bone disorder in which scar-like (fibrous) tissue grows in place of normal bone. This scar tissue appears like an "alphabet soup" on x-rays. 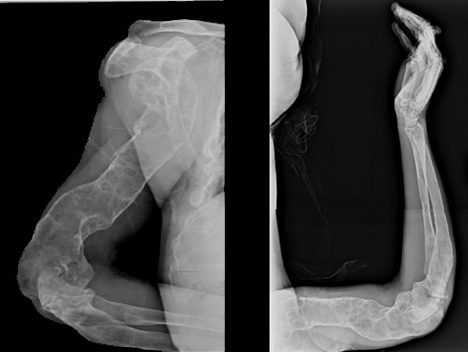 The disorder results in deformity, fracture, and limb length discrepancy. The most pervasive deformity is the Shepherd's crook deformity of the hip. We correct this with a modification of the SUPERhip procedure, which allows acute correction of the neck-shaft angle of the femoral head. A rare genetic disorder in which a person lacks an enzyme called glucocerebrosidase. This results in fatty material, or lipids, accumulating in the body. 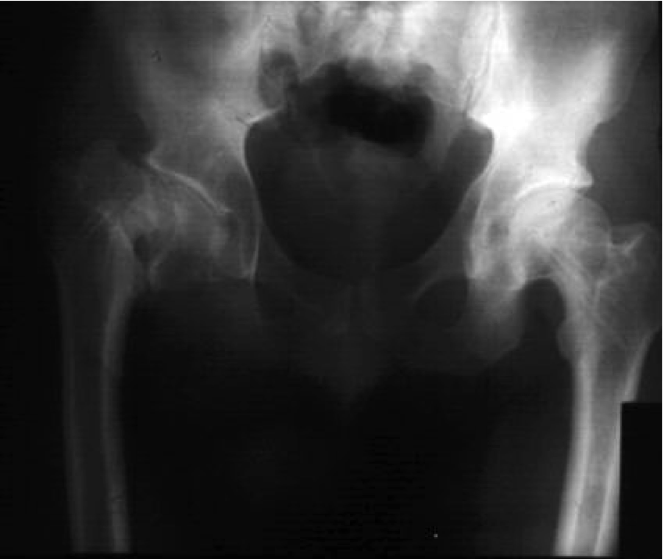 Avascular necrosis of the hip is a common complication of this disorder. We treat the avascular necrosis with a core decompression, hip arthrodiastasis, or femoral head reduction osteotomy (or a combination of those procedures). 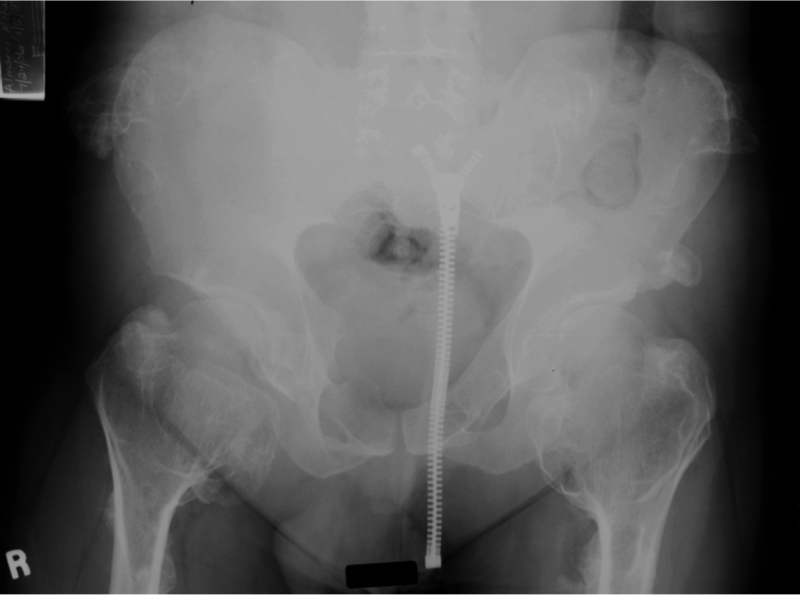 Patient with MHE affecting the hips bilaterally. Note the large osteochondromas on both hips. A rare bone disease characterized by growths of multiple osteochondromas (benign cartilage-capped bone tumors). These outgrowths result in short stature or limb length discrepancy, bony deformity, restricted joint movement, and nerve entrapment. Osteochondromas may form in or near the hip joint, resulting in impingement, loss of range of motion, pain, hip dislocation, acetabular dysplasia, coxa valga, and osteoarthritis. We perform a procedure known as safe surgical dislocation (SSD) to safely resect the osteochondromas and can perform pelvic or femoral osteotomies to correct alignment, as well as femoral head reduction to restore sphericity to the femoral head. A blood infection that occurs in young infants may result in the development of various sequelae later in life. When the hip is affected, a diverse array of difficulties may manifest. We treat this condition with a pelvic support osteotomy (PSO), a hip bypass procedure where the upper femur is bent at an angle to stabilize the connection between the femur and pelvis to eliminate Trendelenburg limp. 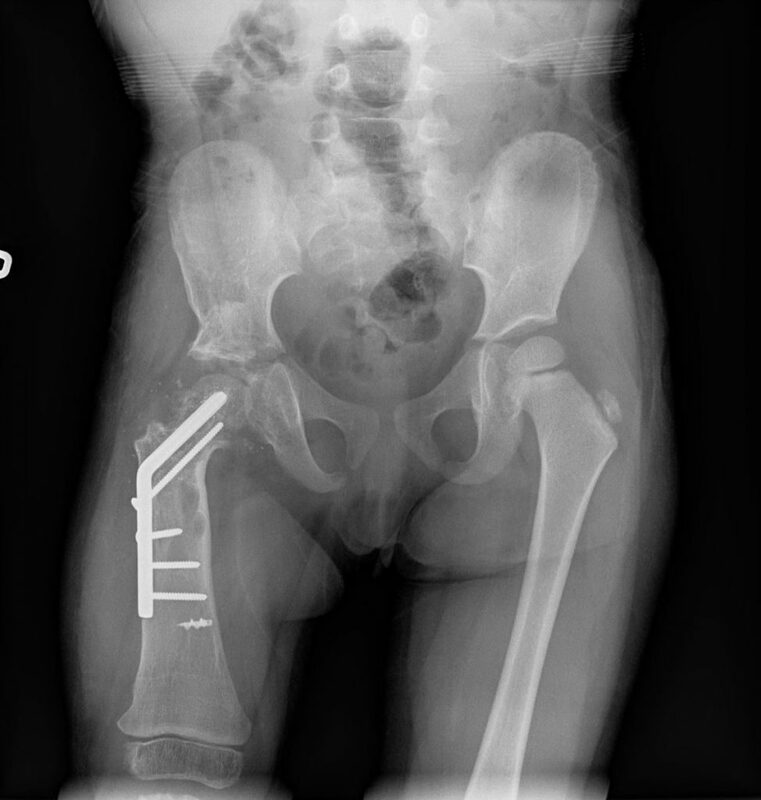 Congenital Femoral Deficiency (CFD) or Proximal Femoral Focal Deficiency (PFFD) is a rare birth defect characterized by a short femur and associated hip and knee deformity, deficiency, or instability. In patients with hip deformity, we perform the SUPERhip procedure to comprehensively correct the hip joint prior to limb lengthening to correct limb length discrepancy. 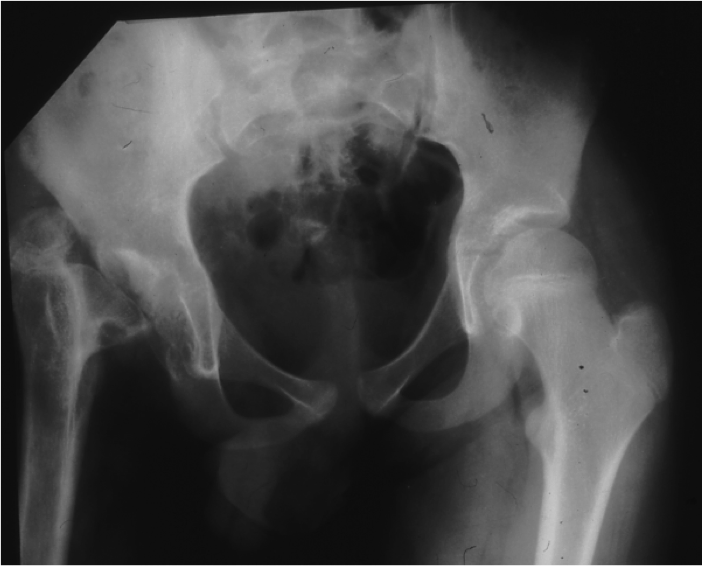 Slipped Capital Femoral Epiphysis (SCFE) is a hip disorder that occurs in adolescence. It occurs when the ball at the upper end of the femur (femoral head) slips off the neck of the femur through a weakness in the upper femoral growth plate. After the slip, the femoral head is facing backwards. Treatment aims to stabilize the slipped femoral head. Prior to surgery, the patient is advised to use crutches to prevent further slippage. In mild cases, the femoral head is fixed with pins or screws. In more severe cases, a safe surgical hip dislocation (SSD) followed by pelvic and/or femoral osteotomies may be required.